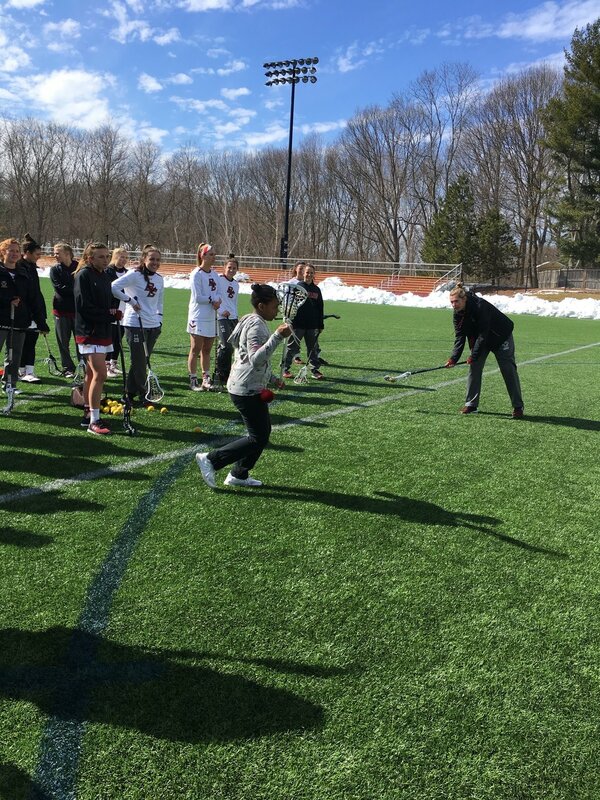 On Saturday, March 18th, the girls of TechBoston Academy had the privilege of visiting Boston College, a formidable institution in the education scene that also houses a top-ranked women's lacrosse program. Less than eight miles separates TechBoston and BC, and an afternoon of soaking in Division 1 lacrosse awaited the eager students. The girls sat front row to the action between ACC foes and top-20 contenders Louisville and BC. After a hard-fought match, in which a Cardinals comeback was stifled by the Eagles, TechBoston was invited onto the field by the winning squad. BC presented the players with sticks, goggles, and individual BC Lacrosse posters signed by each team member. The players were then given the opportunity to try out their new gear during a shoot around with the Eagles. After ripping some shots on goal amidst rowdy cheers from BC players, the TechBoston girls were treated to a private tour of campus, including the athletic training room, the admissions building, the volleyball court, Conte Forum Ice Arena, and the newly renovated women's lacrosse locker room. Inside the bubble on the football field, the TechBoston players challenged the BC players to a 40-yard dash, with 6th grader Cynya taking the triumphant victory. With the day's end, more autographs and enthusiastic promises to see each other again were handed out. We want to extend an enormous thank you to Boston Advisory Board member and BC Head Coach Acacia Walker and her team for the extremely warm welcome, providing the girls with their first taste of D1 lacrosse, and an overall unforgettable day spent with the Eagles. Go BC!